Vineyards of Little Beauty in the Waihopai Valley. 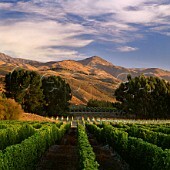 Marlborough, New Zealand. Carménère vineyards of Viña Falernia. Elqui Valley, Chile. Alessandro Ceretto, winemaker. Alba, Piedmont, Italy. The Grande Monastery of Chartreuse. Voiron, Isère, Rhône-Alpes, France.